The Contemplative Mammoth is written by Jacquelyn GIll, an ecologist and biogeographer interested in how landscapes change through space and time (hence the subtitle of this blog: “musings from the fourth dimension,” e.g. time). She combines an interdisciplinary approach and a deep-time perspective to inform conservation and ecology. Here, she writes about ecology and climate change over time from the last ice age to the present day, and how our understanding of the past can help prepare us for the future. She also writes about Academia, diversity in STEM, science communication, and the occasional dung fungus. 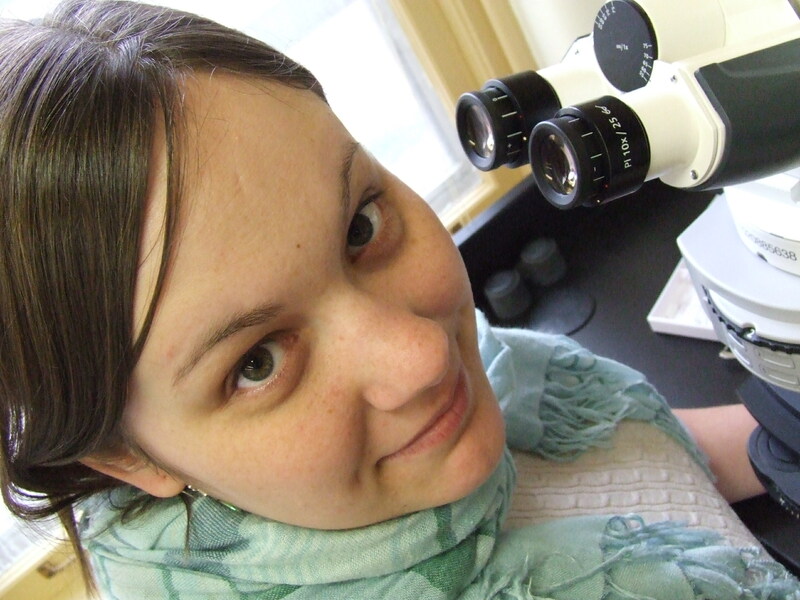 In Fall 2013, Jacquelyn joined the University of Maine as an Assistant Professor of Paleoecology & Plant Ecology with the School of Biology & Ecology and the Climate Change Institute. In addition to geeking out in the lab, in the field, and online, she enjoys games, knitting, science fiction, discovering new craft cocktails, cuddling her furry mesofauna, and exploring Maine’s forests, rivers, and islands. Comments? Suggestions? Questions? Feel free to contact Jacquelyn at jacquelynlgill[at]gmail[dot]com, or check out her academic website. Such a nice blog! I remember when you were here with us “Badgers,” and your energy and thoughtfulness on Twitter with regard to the political upheavals here from 2011 on. You are missed here, I am sure! But we Badgers remain proud of all the academics like yourself who’ve gone on from here to bright futures, to continue the all-important task of educating the world. Thank you so much for the kind words! I dearly loved my time in Wisconsin and will always consider myself a Badger at heart. UW is such an incredible institution; it’s a beacon that shines all the brighter for sending its light out into the world. I hope it weathers the storm, and wish you all the best. Thank you, too! I believe that UW will weather storm – it has too! I believe we all will. But a storm it has been! Good people like you, self-identifying as “a Badger at heart” – sure is part of the charm this place both imports & exports. My son is a UMO undergraduate student in Communications. He is working for the State of Massachusetts as a caretaker for an uninhabited island within Boston Harbor. He works 5 days a week and sleeps in a tent 4 nights a week. On his own, he decided to start Twitter and Instagram feeds for Lovells Island. He is hoping to educate as many people as possible about the beauty and easy access to the island. He feels the more people see his and other islands in Boston Harbor, the more they will protect and care for the ocean. It would be great if you could follow him and maybe give him a retweet and a like or two. We live in Hawaii now but are from Maine. Funny I randomly pulled your blog up! Looks interesting, looking forward to reading more. Aloha. I came across your blog from Freshly Pressed, and I’m so glad that I did! I’m a student studying biological science at Southern Maine Community College. I’m glad to see a fellow Mainer and blogger (I’m not a scientist yet!). What I really mean is: I like your blog. Thanks so much! Good luck with your work, and I hope we cross paths one day. 😀 That would be awesome! Hi Jacquelyn, I’m pleased I came across your blog. It’s very relevant to my interests, but I’m only a mere artist that works with similar ideas and topics. I’m working towards an exhibition about ‘Water’ and I’m looking into collaborating with a scientist, like yourself. If you’d like to know more please reply to my message here, I’m happy to email with more. Thanks for your interest! I’d love to chat with you more. Send me an email to jacquelynlgill at gmail, and I’d be happy to chat. What an incredible blog you have here with such a wide variety of interests. You rock! Thanks for this! It’s great to find another paleo-resource on the web. Jacquelyn: Thank you. I am much relieved. I had a kneejerk reaction and then realized (the ufo/pyramids stuff was a hint) that maybe my usual sense of irony and satire had failed me. Again, my apologies and I’ll pay closer attention from now on. Choice b) above seems the best course. Perhaps I’ll contribute. In the meantime I’ll go self-medicate (have a beer). No problem! I’m happy to clarify. A beer sounds perfect! Ok, I’m only a lowly failed academic with a masters in geography from the University of Washington. I just finished reading how to argue with a scientist and I have to ask you if my sense of irony and satire have failed me here. That is to say, regarding your opening paragraph, you can’t be serious re autism and anthropogenic global climate change — although your first commenter certainly thinks so and you have done nothing to disabuse him/her. If you aren’t, my apologies although it is still a poor choice of examples imho. If you are, oh my! Praise the autonomic nervous system. No, I am absolutely not serious, which hopefully came across if you read further (e.g., UFO abduction support groups). Rather, I am serious about science communication, and science literacy, which I am addressing in a hopefully-funny-but-true-post. My point was that, if folks making those kinds of arguments actually tried to use the tips I posted, they would find themselves unable to come up with the evidence necessary, thereby disproving their own arguments. Scientists can have a good laugh because they encounter these sorts of arguments all the time, and everyone else might actually get something useful out of the post (i.e., a concise description of, say, sample size). As for the first commenter, if you re-read his comment, he was aware of the satire, but took issue with my being a climate scientist– that is, he’s a classic climate change denier. I haven’t “disabused” his comment yet because a) it’s been about an hour, and I’m making dinner, b) I’m kind of hoping my readers will do it for me, and c) I haven’t decided which tack to take yet. Sometimes it’s better not to feed the trolls. Hey Jacquelyn! I nominated you for the Liebster Award. You should check out my latest blog post to see what it’s all about.